ملکانی, امین, دوست‏ حسینی, کاظم, فائزی پور, مهدی, لایقی, محمد. (1392). تاثیر کاربرد گرافیت پودری بر انتقال حرارت و ویژگی‏های فیزیکی و مکانیکی تخته خرده چوب 3 لایه. مجله صنایع چوب و کاغذ ایران, 4(2), 123-130. امین ملکانی; کاظم دوست‏ حسینی; مهدی فائزی پور; محمد لایقی. "تاثیر کاربرد گرافیت پودری بر انتقال حرارت و ویژگی‏های فیزیکی و مکانیکی تخته خرده چوب 3 لایه". مجله صنایع چوب و کاغذ ایران, 4, 2, 1392, 123-130. ملکانی, امین, دوست‏ حسینی, کاظم, فائزی پور, مهدی, لایقی, محمد. (1392). 'تاثیر کاربرد گرافیت پودری بر انتقال حرارت و ویژگی‏های فیزیکی و مکانیکی تخته خرده چوب 3 لایه', مجله صنایع چوب و کاغذ ایران, 4(2), pp. 123-130. ملکانی, امین, دوست‏ حسینی, کاظم, فائزی پور, مهدی, لایقی, محمد. تاثیر کاربرد گرافیت پودری بر انتقال حرارت و ویژگی‏های فیزیکی و مکانیکی تخته خرده چوب 3 لایه. مجله صنایع چوب و کاغذ ایران, 1392; 4(2): 123-130. Motie, N., 2008. Minimizing hot-press time in the manufacturing process of wood plastic composites using thermally conductive fillers, M. Sc. Thesis, dept. of Wood and Paper, University of Tehran. 60 pages. (In Persian). Raeisi, M., Enayati, A.A., Doosthoseini, K. and Pourtahmasi, K., 2012. Effect evaluation of layering technique effect with poplar on surface roughness of particleboard, Journal of Wood and Forest Science and Technology, 19 (2): 59-74. (In Persian). Heiser, L., King, A., 2004. Thermally conductive carbon filler Nylon 6.6, Polymer composites, 25(2): 186–193. Easter, J., Chio, S. and Li, S., 2001. Anomalously increased effective thermal conductivies of ethylenglycon-based ano fluidcontaning Cu Nano particles, Applied physics letter, 78(6):7-20. Matuana, L.M., 2003. Thermally conductive carbon filler in wood-based composites, Forest products Journal, 53,3. ABI/INFORM Global. Doosthoseini K. 2007. Wood composite materials Manufacturing Applications, 2th., University of Tehran, 708 pages. (In Persian). Doosthoseini, K., Mohammadkazemi, F., 2011. Investigating of the effect of using bagasse and isocyanate adhesive on the 3-layer particleboard manufacturing, Wood and Paper Science Research 26 (2):300-313. (In Persian). Lin, H.C., Fujimoto, Y. and Murase, Y., 2002. Influences of particle size and moisture content on Ultrasonic wave transmission characteristics in thickness direction particleboard, Journal of the Faculty of Agriculture, Kyushu University, 46(2): 433 – 444. Nasiri, N. 2001. Utilization of particle wood’s shape in particleboard production, M.sc. 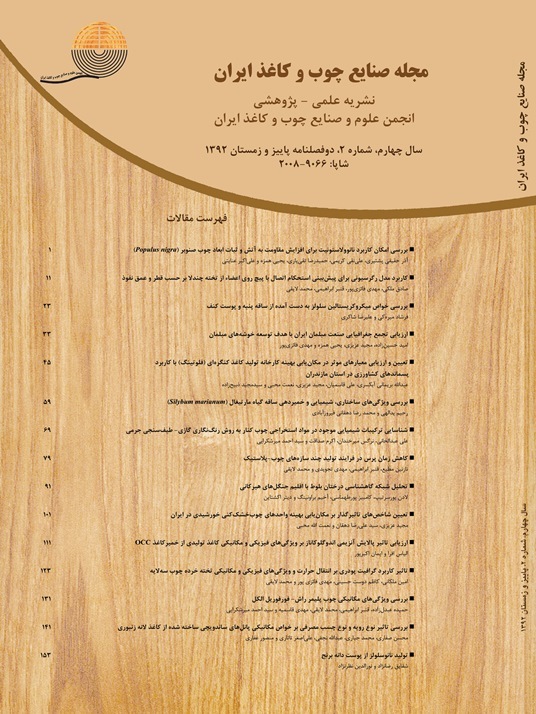 Thesis, Department of Wood and Paper, University of Tehran. 146 pp. (In Persian).